I'm participating in a Team Build of this little steam engine with a bunch of guys over on the HMEM board. I'll document the progress here. A Team Build is where a group of guys get together to make multiple copies of a single project. Each machinist is assigned one or more parts and at the end, the Team Captain assembles them all and ships the completed assemblies out to the team members. It's a fun alternative to doing it all yourself. It's also a tremendous learning opportunity. When you're a home shop machinist, most of your work is one-offs. Consequently, we often fall into the lazy habit of machining a part "close enough", and then just modifying any part that it fits with to compensate. There is less scrap that way, but it is definitely the "lazy" way! - 5C Collet Chuck: This cheap little chuck had lain on the shelf for almost two years after I got it for a bargain. Through some heroic efforts I took a chuck that would've been good to 3 - 5 thousandths and made it repeatably accurate to 2 or 3 tenths. It has been a real productivity enhancer for this job, and I don't know how I ever did without a collet chuck in the past. With the collet chuck goes an inexpensive imported square collet block so I can carry the work over to the mill as needed. - Button V-Block: This handy fixture was inspired by a Dubosky article from my Metalworking book. It is a round V-block instead of the normal square ones and is ideal for certain operations such as small connecting rods. Easily made and indispensible. - Compound DRO: I have no DRO on my lathe because it is my intent to convert it to CNC operation. Yet, a DRO makes things so much easier. The one I use most in my shop has been a simple quill DRO I made for my mill. The lathe equivalent of a quill DRO is to put a scale on your compound slide. It's amazing how much mileage I've gotten out of this on this project in exchange for barely an hour's work and a cheap import digital caliper I never liked anyway. - Vise Stop: I made this a while back, but it really has been useful on this project. Lots of other tooling was involved, of course, but those four items really made this project possible and were all things I made for myself (or at least the backplate on the collet chuck I made!). If I add up the time spent on the tooling, it would come close to exceeding the time spent making the parts, and certainly would exceed if we count the vise stop which I made some time ago. Was it worth it to spend as much or more time on tooling as parts? In my mind, it was, simply because this tooling will make me more productive on future projects. Certainly the collet chuck vise stop, and compound DRO will have extremely broad applicability. Still I do somewhat hope every new project doesn't require me to build so much tooling! It's one reason why I probably buy more off-the-shelf tooling than many. For example, even though I could easily make a set of machinist's jacks, they're so cheap at Enco, and I've got so many projects to get done. Most of the tooling I list here is harder to buy off the shelf or a lot more expensive than the jacks! Plans are available in pdf format here. I'll be making 12 of these beauties, all in brass. Here is a pictorial description of how I finally settled on making my 12 flywheels. Now turn the piece. Just take off enough so it is round and machined all over. Don't run into the collet! Note: If I had to make another 12, I would not do this step here. Once the overall slug has been turned and faced to length (see way down below, I do actually do this on one), the collet stop lets us do one shoulder, and then flip around to do the other without resetting the depth of cut. That's faster! Zero your compound DRO. What's that, no compound DRO? Well, I made mine just for this project, but I can tell I'll use it a lot! After that first time, I knew what the cross slide dial should read ("50" for this part). You can tell by looking which revolution to stop at that dial number on. Goes really fast that way! Forgot to take a picture, but the last step before removing any part from the collet is a little deburr with a file. The reason is so that when you flip the part around there is no burr to interfere with the accuracy of the collet. Here we are all parted. Note there is a variable amount of the larger diameter material left, but not very much. Also note the lower right part has no shoulder. I had to remake one of these due to an error on the first one. I decided it was faster to do both shoulders last because I can just flip the part once the shoulder cut is set up and do both shoulders at once. The next step is easy. We're going to flip the part around in the collet, face it to exact length, and then put the little shoulder on the flipped side. Cut the shoulder from this zero point another 0.0156" until the cross slide dial reads "50" on the right revolution and we're done! The parts are now dimensionally correct! Plans call for a 5-40, so I have the proper set screws and a couple spiral flute taps on order from Enco. I'll be using collets on the mill to line things up. I thought it a good idea to try a few things along the way rather than just diving into production. My goal was to learn some new things and come up with a better mousetrap for cranking these things out. If you've never had to make more than one of a part, it's an interesting pastime to try to put together your optimum assembly line process. - Turn the OD on my brass stock down to 1" diameter and polish with brass polish. I'll do this turning between centers. 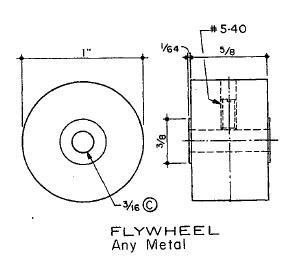 - Part off the individual flywheels. - Face each end in a chuck and put the 1/64" shoulder on while facing. Polish the shoulders, but leave the facing stock from shoulder to end of flywheel with a matte finish. Perhaps a little coarse emery. - Bore and ream the 3/16" hole. - Take to the mill and drill and thread the 5-40 set screw hole (grub screw for those across the pond). A concern I had is the close fit 3/8" hole. I planned to ream the hole. Looking at some helpful information from Yankee Reamer, I conclude that for a tolerance of 0.0005", I want to ream 0.0003-0.0004" below the finished size. 3/8" = 0.3750", so I want a reamer that is 0.3746 - 0.3747" in diameter. That sounds like an undersized 3/8" to me. 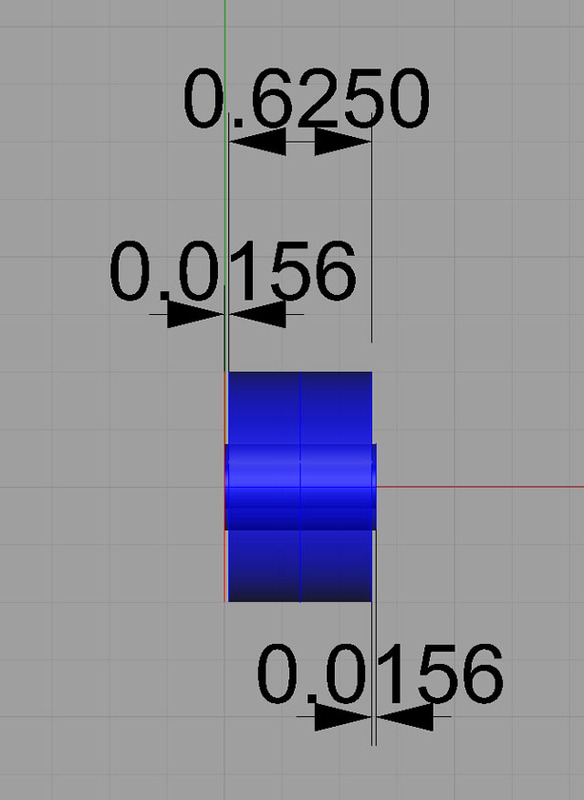 Further, they suggest the reamer should be removing 0.007 to 0.015" of stock, which means I want to drill an initial hole that is 0.3676 - 0.3732" in diameter. They suggest an oversize allowance of 0.0048" for the drill bit. Hence, we want a drill bit that ranges from 0.3676 - 0.0048 = 0.3628" to 0.3732 - 0.0048 = 0.3648". That's going to be a "U" sized drill whose diameter is 0.3680". If I leave 0.1" on either side of the rough stock, I get a total width for the rough stock of circa 0.860". If I choose to do 4 flywheels per piece of stock, I need 3 pieces of brass round stock each 3.5" long. I started out by sticking the brass stock in my 6-jaw and putting a quick center drill hole there for the tailstock. Boy, I sure like having a keyless chuck and a tailstock cam lock to make stuff like this go really fast! I'm doing several experiments on the project. For example, I start out turning with my CCMT turning tools until I get things into reasonable shape. Also, I wanted to see how close I could come to holding 1" along the entire 8" length of this brass cylinder by tuning up the lathe tailstock set over, and then by hand tuning the dial while the feed was in motion. Such accuracy is not needed for the flywheel, but these are experiments I like to do as I go to stay in practice or learn something new. What I'm doing here is cutting a bit, measuring the taper with a micrometer (I have both vernier and digital and make myself use the vernier for the first 5 or 6 measurements on a project before I go to my Mitutoyo digitals. That's just to stay in practice), and tweaking the tailstock until I got the tailstock end to be smaller than the headstock end. That's as much as you can do adjusting the tailstock set over. When was the last time you adjusted yours? Once I got happy with my taper adjustments, and I got the shaft a lot closer to 1" in diameter (I was about 0.050" over), I pulled out my HSS steel finishing cutter. It has a big radius and a sharp edge. Folks say it leaves a nicer surface finish. I think the latter is very slight compared to my CCMT's, but it is discernable, so why not use the HSS? Isn't it nice to cut brass? So shiny! So easy! Okay this one is tricky. Remember I said I would tweak the dial during the feed to offset the taper? I mic'd both ends after a shallow (0.005") cut. I determined that based on the taper I was seeing (0.003" over 8"), I could turn the dial by eye a little less than half a division each 1/4 of the shaft length. I performed my final pass while doing so, and then mic'd the resulting 1/4 sections of the shaft. You can see my results rounded to the nearest thousandth though my mic reads to 1/10 of tenth. Not too bad. The second quadrant I was a little too aggressive and it's 0.999". The leftmost quadrant I was a little late and was 0.001" too big at the end. I know exactly how both happened. On the second quadrant, I got confused about diameter versus radius (move the dial 0.001", did diameter reduce 0.001" or 0.002"). Things were moving too fast and I'd never tried this. I knew as soon as I'd done it I went too far. So I slowed up to try to compensate on future turns. On that 4th quadrant (leftmost), I was lagging it and hence was 0.001" over. All in all, I rate this as not bad for a first try. As I said up front, the little flywheel doesn't need even a thou of accuracy on its diameter. This was just a random exercise in precision to sharpen my skills and try a new technique. You'll notice also no use of calipers! I went back with my Mitutoyo calipers and it would be easy to conclude the whole shaft was dead nuts on with them. Calipers are not precision instruments, micrometers are! Here is the aftermath of 150 grit. For the final "mirror" finish, many folks swear by Brasso. I thought I had a nifty idea. Lautard likes to run sandpaper up and over a file to use it on a lathe. I bought some cheap synthetic chamois to use with the brasso. Bad news: I got scratches and had to drop back to my 220! Aha! When used with a paper towel, the Brasso finally shines it up! Seems my cheap chamois had grit in it. I would sure hate to use that on a car's paint job! Use your file to knock the shoulder burr off before removing the part from the collet. The part wont seat accurately in a collet with that shoulder burr there after facing! I can't tell you how many times I pulled the part out and had to put it right back in to take that burr off. Develop the habit! For this batch of flywheels, I am following the plan and cutting slugs to length on saw, facing to exact length, drill, ream, add the little shoulders. Then I noted where the dial should wind up when I was done with the shoulder. Fast and easy! To polish, I'm going to suspend the flywheels between two centers. The falderoll at the top of starting from finished stock was a losing proposition because the collets do mar the finish. Apparently you can purchase nylong 5C collets to avoid this. In my case, I simply switched over to a polishing rig that makes it pretty easy. That rig involves suspending the part between two centers. I use a dead center in the collet chuck to drive the part and a live center in the tailstock. As I was inspecting parts, I noticed a couple of outliers that had diameters more than 5 thousandths off the 1.000 spec, so I decided to see if the polishing rig would fix that up.